Still undiscovered by many, Northern Ireland hides some of the best natural wonders on the whole of the Emerald Isle: from an unspoilt coastline shaped by giants to stunning valleys that have inspired writers and artists throughout time. The region’s most famous driving route, the scenic Causeway Coast, starts just minutes from Belfast City and winds along the narrow strip of coastline between the North Channel and steep cliffs. It takes you on an outstanding journey through Northern Ireland’s cultural and natural heritage. 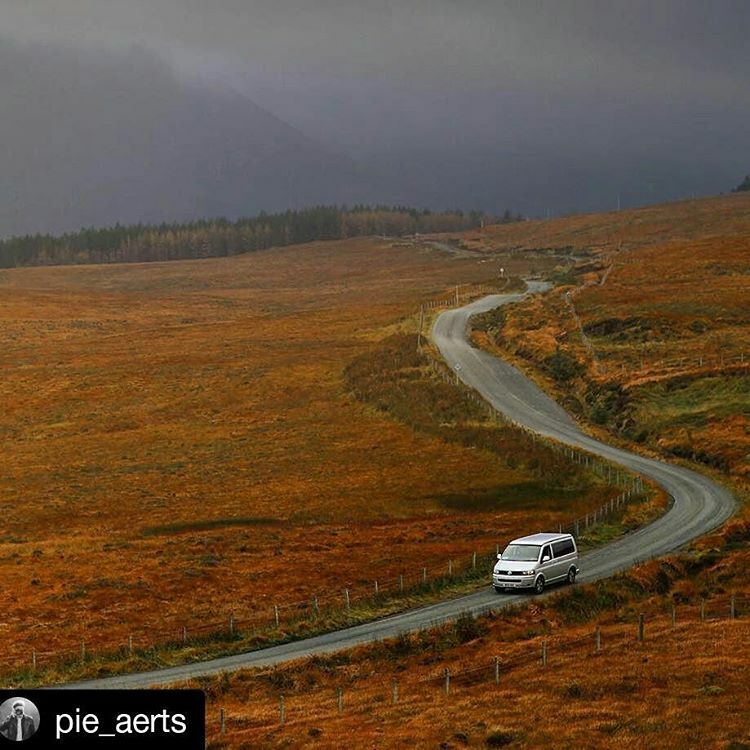 Ranked among the Top Five Road Trips worldwide, the Causeway Coastal route is the perfect place to enjoy a relaxing campervan holiday in Northern Ireland. 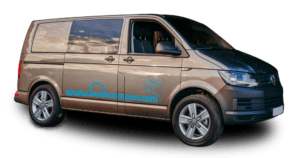 With several direct flights to Belfast – where the route starts – from the UK & Europe and many low cost flights to Dublin, you can hire a campervan from Bunk Campers’ Belfast or Dublin depots and start your road trip just after landing. 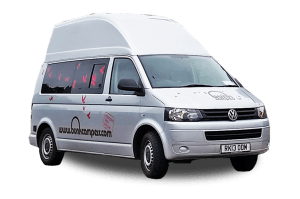 A campervan is a great option for the route, offering transport and self-catering accommodation in one for your holiday. 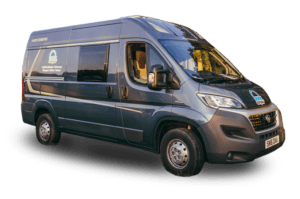 From the painted walls of Belfast to the stone walls of Derry, follow this 7-day driving tour to discover the Causeway Coastal Route with the freedom and comfort of a home on wheels. 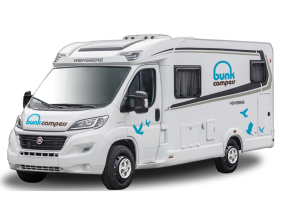 After picking up your Bunk Camper, you will still have plenty of time to visit Belfast, capital of Northern Ireland. 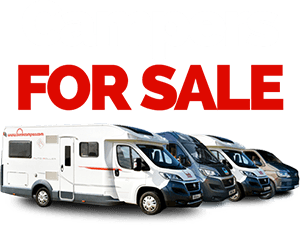 Choose a compact 2 person camping car, fully equipped 2-4 berth vans or luxury motorhomes from up to 6 people. Park up for a few hours and enjoy a journey back in time around the city’s political murals, narrated by a London-style black taxi driver. 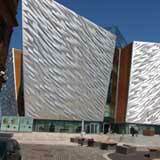 Then, explore the Titanic Quarter, birthplace of the most famous ship in the world. When the sun goes down, make sure you sample the bohemian nightlife of the Cathedral Quarter. 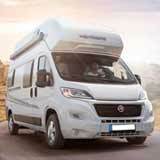 Time to get off the beaten track in your camper! Take the Antrim Coast Road (A2) to Carrickfergus and stroll around the town (a visit to its Norman castle is compulsory!). Continue along the A2 towards Larne, main access to the stunning nine Glens of Antrim. A few miles away from Carrickfergus, you can find the recently opened Gobbins Cliff Path which takes you on an exciting walk alongside the steep Gobbins cliffs across bridges, caves and tunnels. This dramatic coastal walk is also well-known for its rich and unique wildlife. Starring in popular Irish songs and tales, explore this area of outstanding beauty as long as you can. Visit Glenariff Forest Park, the queen of the glens, and take a stroll along the magic Waterfall Walkway. Cook a hot meal on board your camper and don’t miss the chance to follow the other trails and enjoy a picnic with scenic landscapes and peaceful rivers as background. After the outdoor adventure, lead your campervan around the charming villages of the area: discover the Irish charm of Carnlough, the four waterfalls of Gleno or the folk music sessions of Glenarm. Look for a nearby campsite to spend the night. Why not take a warm shower in your camper, open a bottle of wine and dine under the stars to refuel energy for the next day? After waking up to the magnificent views of the glens, drive towards Cushendun with its picturesque cottages. Continue via the Torr Road to the headland of the same name. Providing impressive views over the Mull of Kintyre, Torr Head is an ideal spot to park up and have lunch against the wild sound of the waves and ruined buildings filled with history. Continue towards the natural beauty of Murlough Bay/Fairhead and Ballycastle’s harbour, where you can take a ferry to Rathlin Island. Six miles long and one mile wide, the island, its 140 inhabitants and all the legends surrounding Rathlin are well worth visiting! 10 minutes west from Ballycastle you will find the dizzy Carrick-a-Rede bridge, sitting 30 metres above the rocks below. Whether you dare to cross it or not, you will be amazed at the views from the coastline. Continue the drive to the fishing village Ballintoy, whose stunning harbour has been featured in Game of Thrones as the Iron Islands. Few miles away, you will arrive to the mythic Giant’s Causeway, one of the great wonders of the world. Jump over Giants’ steps, discover the legend behind these thousands of basalt columns and learn the history of these rugged waters that once sank the invincible galleon and treasures of the Spanish Armada. 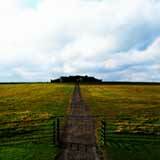 In the afternoon, head towards the Old Bushmills Distillery, home of Northern Ireland’s most famous whiskey. 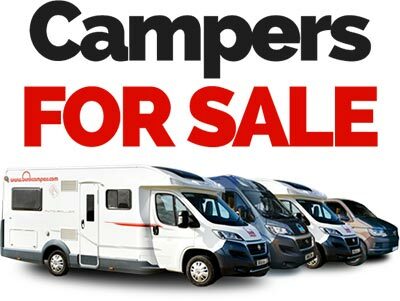 After the tour, why not get a bottle to sample some glasses later on in your camper? 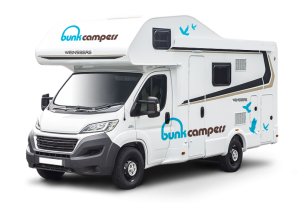 Just next to the distillery you can find a friendly and small campsite where you can stay at a discounted rate thanks to Bunk Campers’ UK Camping and Caravanning Club. Keep driving west and stop by the romantic ruins of Dunluce Castle and the seaside resorts of Portrush and Portstewart. If you have enough time, divert along the scenic drive along the river Bann valley for some outdoor adventure: fishing, biking, hiking… you will find plenty of activities to fill up your morning. On the way back to the A2, Ballymoney and Coleraine have history, heritage, restaurants and shops to please all kinds of visitors. Wake up early to make the most of the last day of your trip! Limavady is a vibrant town perfect to buy some last groceries. Next to it, you can explore the breath-taking Roe Valley Country Park before heading to Derry~Londonderry. The perfect place to end the trip and learn more about Northern Ireland’s political history, Derry’s 17th century walls surround both past years of conflict and present times of local friendliness. 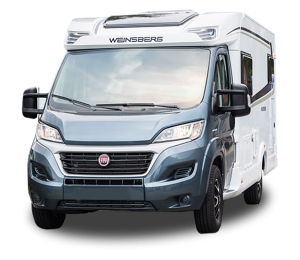 By touring the Causeway Coastal Route in a campervan, you will find yourself either gazing at some of the world’s more impressive natural wonders or living a journey back in time. 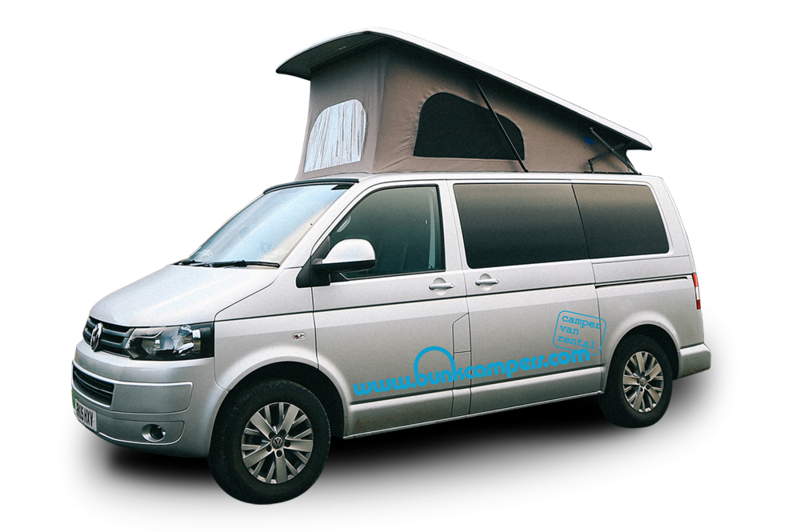 With 8 different models to suit all kinds of tastes and budgets, hire a campervan with Bunk Campers from only £45 per day 2018. 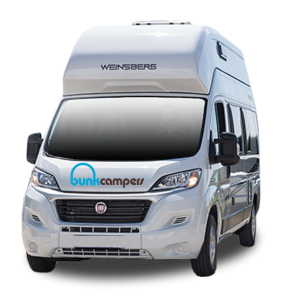 Your Bunk Camper will provide all the perks of home at a car rental fare! For more information and booking, please fill the contact form or use the online booking engine. 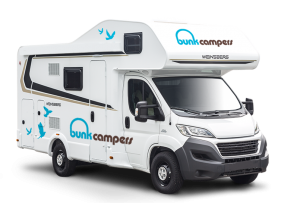 Don’t forget to follow Bunk Campers on Facebook and Twitter to be updated on the latest promotions, travel routes and tips!